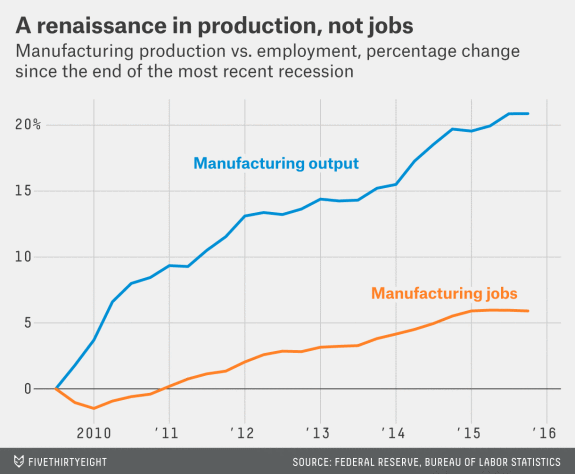 Ben Casselman, writing on the website FiveThirtyEight, says that manufacturing jobs are never coming back. He warns candidates to not inflame voters with empty promises and provides facts to prove his point. It’s understandable that voters are angry about trade. The U.S. has lost more than 4.5 million manufacturing jobs since NAFTA took effect in 1994. And there’s mounting evidence that U.S. trade policy, particularly with China, has caused lasting harm to many American workers. But rather than play to that anger, candidates ought to be talking about ways to ensure that the service sector can fill manufacturing’s former role as a provider of dependable, decent-paying jobs. Here’s the problem: Whether or not those manufacturing jobs could have been saved, they aren’t coming back, at least not most of them. How do we know? 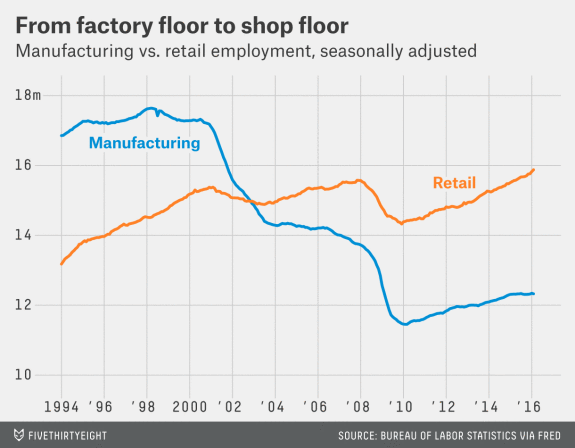 Because in recent years, factories have been coming back, but the jobs haven’t. Because of rising wages in China, the need for shorter supply chains, and other factors, a small but growing group of companies are shifting production back to the U.S. But the factories they build here are heavily automated, employing a small fraction of the workers they would have a generation ago. Look at the chart above. Since the recession ended in 2009, manufacturing output has risen by more than 20% because of a combination of “reshoring” and increased demand. But manufacturing employment is up just 5%. And much of that growth represents a rebound from the recession, not a sustainable trend. In 1994 there were 3.5 million more Americans working in manufacturing than in retail. Today, those numbers have almost exactly reversed. More than 80% of all private jobs are now in the retail sector. Like it or not, the U.S. is now a service-based economy. This is not new news. To read the complete Casselman article, click here. Remember the 1998 movie Primary Colors with John Travolta, Emma Thompson, Kathy Bates, Billy Bob Thorton, Adrian Lester, Rob Reiner and Larry Hagman? The movie about Bill Clinton's 1992 run for the White House but with fictional characters? Gov. Jack Stanton was the candidate? There's a scene during the campaign where Gov. Stanton addresses a group of union workers at a union hall. I know you work hard and have little time to rest. Some of us got more time than we'd like. Right, I understand. Since this factory closed, how many of you have found work? Raise your hands. How many of you work jobs that just pay the rent, no matter how many hours you work? My mama worked jobs like that after my daddy died. I remember her coming home from work just bone weary. I know she wanted to play with me and ask me about school. But sometimes you're too tired to do anything but blob out In front of the tube. I don't have to tell you how hard it is to find work. . . or anything at all about hard times. So I'm going to do something really outrageous. I'm going to tell the truth. I know what you're thinking. He must be really desperate to do that. But if you've had to swallow enough sh-garbage- Here's the truth. No politician can re-open this factory or bring back the jobs. . . or make your union strong again. No politician can make it the way it was. Because we now live in a world without economic borders. Push a button in New York and a billion dollars moves to Tokyo. In that world, muscle jobs go where muscle labor is cheap, and that is not here. So to compete, you have to exercise a different muscle: the one between your ears. The whole country must go back to school. We have to get smarter, learn skills. And I promise this: I will work hard for you. I will think about you. I will fight to make education a lifetime thing in this country. . . to give you the support you need to move up. But you have to do the heavy lifting your own selves. Now, I've taken a lot of hits in this campaign. But you know what that means? It means someone thinks you're interested in that kind of garbage. Tuesday, when you go to cast your vote, think about that. Think about what you' re really interested in. Then pick your candidate. Don't you wish for this type of candor? Especially in light of the facts? I do.